Today was “Black Friday,” the day when Americans glorify greed right after pausing briefly to be thankful for all of our abundant blessings. I got roped into going shopping on Black Friday over 15 years ago. The friend who talked me into it did it every year. She urged me to look through the flyer and pick out some toys on sale for my kids. I found three toys that I thought my kids might like and that were in my budget. My friend told me that we had to be up at Walmart no later than 5:00 a.m. I thought she was crazy. We got there at 5:00 a.m. The parking lot was full. We had trouble finding a cart. Every aisle in the store was blocked with shopping carts, some of them piled with three or four televisions. I could see in an instant that this was not going to be worth the meager $30 that I hoped to spend. I couldn’t leave because I had come with my friend, though, so we manhandled the cart through the store. One of the items I wanted was already sold out, so I ended up getting only two things. The checkout lanes didn’t open till 6:00, but by 5:30 every lane had a line at least 15 carts long. It was one of the most miserable few hours of my life. I am just not enough in love with “stuff” to be willing to participate in that kind of free-for-all ever again. I try to make a point of not going out on the day after Thanksgiving. Today I did end up having to go out to put gas in the car and get a couple of grocery items, but by then the frenzy was long over and I was in and out very quickly. It was a nice relaxing day, except for my poor sick husband who had to work two jobs by himself because Lucy was even sicker and unable to work with him. I am still sick also and had to lie down multiple times. Pretty much everyone is sick except Flynn now. This afternoon when the kids all went out to Starbucks, I had the house to myself and was able to muster enough energy to make bacon bread–both regular and gluten free. I think it will be especially good to make turkey salad sandwiches with! Mary, Lucy and Jordan went to a movie with some friends this afternoon, so we had supper a little late when they got back. Then my poor sick Mary set to work putting the lights on our Christmas tree, because she is the expert and she know that I physically can’t really do it anymore with my bad back, hips and knees. Everybody else watched episode after episode of Duck Dynasty while Mary steadily worked on the tree. It is so nice to have the lights up! Tomorrow, Mary and Jordan have to leave. We’re dreading it. And I feel so bad that they have to drive all the way home with both of them sick! Yesterday, of course, was mostly about preparation for today. I was up early and at Walmart doing the last of my shopping. Jasper made some excellent breakfast when I returned. I am suffering from a distressing dilemma. Tuesday night Lucy accidentally knocked down and broke a couple of mugs, and one of them was my one remaining special mug that I used multiple times every day. What was special about it? Well, I have rather strict requirements for mugs. I rarely use small mugs because I rarely want a small amount of tea. So, I like large ceramic mugs. When I say large, I mean in the neighborhood of 20 ounces. And I like them to be tall and narrow rather than large and squat. Furthermore, they must be thin, especially at the rim, and the handle must be large to accommodate my arthritic hand. So after lunch yesterday, I took Mary and Lucy to Starbucks with very definite ulterior motive. I’ve noticed that Starbucks often sells tall, large mugs, and I was desperate enough to darken their doors in order to get one. Alas, Starbucks let me down. They did have tall large mugs, but they weren’t ceramic. The largest ceramic ones were Christmas-themed and not big enough and they had a big Starbucks logo on them. *sigh* The search continues. Mary made a gluten free coconut pie and we also made an apple pie and of course a pumpkin pie. 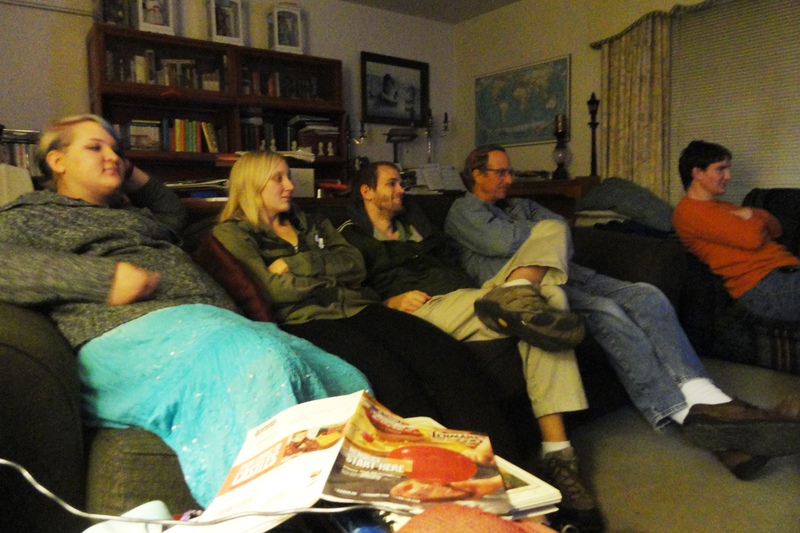 Then after supper we went to church for prayer meeting and a pie social. Flynn was able to join us before the pie was all gone, after driving over from Dallas. I was up very late last night because of my determination to have green bean casserole today. Green bean casserole is normally very easy to make. You have beans. You dump in some cream of mushroom soup, sour cream, seasonings, and French fried onions, sprinkle more onions on top, and pop it in the oven. The problem is that both store-bought cream of mushroom soup and French fried onions contain gluten. So making gluten free green bean casserole is a whole lot more trouble. First you have to make the fried onions. This involved peeling and slicing an onion into rings, which had to be separated. Then you soak them in buttermilk for hours. Then (and I am not making this up) you take each individual onion ring out of the buttermilk and carefully peel away the membrane that lines the inside of the ring. This is very tedious, time-consuming, and messy. The point of it is that the coating sticks to the onion rings a lot better if you remove the membrane. So anyway, the de-membraned rings go back into the buttermilk bath while you go make the gluten-free flour coating. Each ring must be removed from the buttermilk, dredged in the flour, and put on a rack to dry while you go heat up the oil in your skillet. Then you deep fry a few at a time until they are crispy. This is what I was doing after midnight last night. I will say that the onions tasted fabulous when I tested them, but it was still an awful lot of work to go to for one side dish. Today I still had to make the mushroom soup from scratch and then assemble the casserole. And yes, it was pretty tasty. But I think if I’m going to do the gluten-free version again, I’ll make it a month ahead and freeze it! Today I was up early putting the turkey in the oven (after wrestling with it for several minutes), and also our classic holiday brunch casserole. We had a great breakfast around the table and then I was actually able to get a brief rest in between cooking tasks. Mary was such a huge help, despite the fact that she is now sick too. In fact, the sickie list now includes Spencer (who brought the evil illness to our house), me, Lucy, Walter, and Mary. Mary had the brilliant idea of using our whiteboard for doing our annual Thanksgiving poster. The whiteboard is on the sliding door that goes across the end of the dining room. 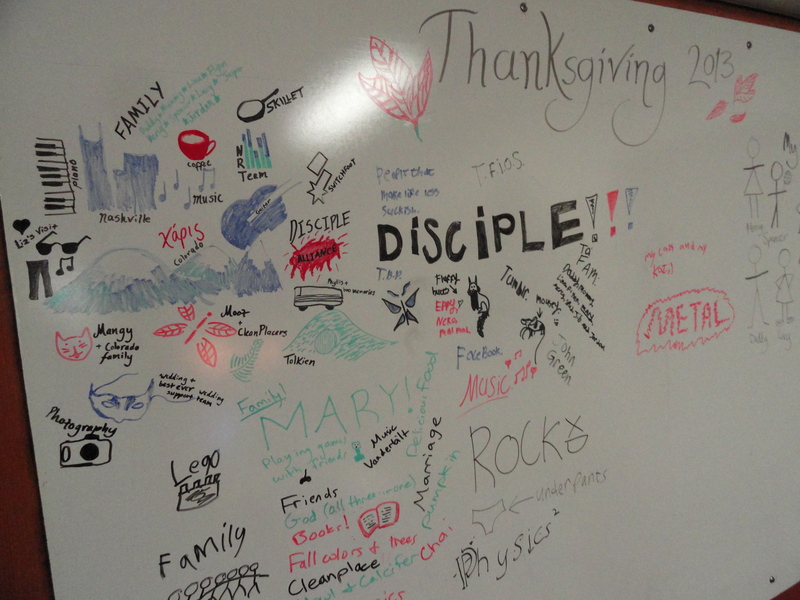 We used our motley collection of dry erase markers to draw and write things that we are thankful for. We have so much to be thankful for! Most of our menu was gluten free. We did have two versions of a few items–biscuits, corn pudding, and stuffing. I was pleasantly surprised by the GF stuffing. I’m sure I will make it again. We had a lovely dinner, followed by a phone conversation with Lina in Zambia. 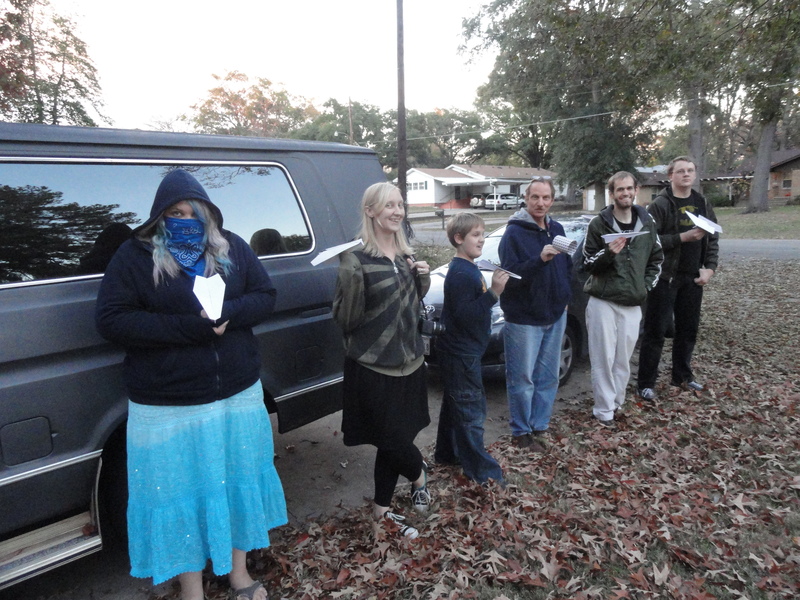 Then Kat came over and we all had pie before tackling our annual Thanksgiving paper airplane competition. Jordan was the overall winner after several heats. It was a beautiful chilly but sunny afternoon and I enjoyed being outdoors for a few minutes. We don’t have supper on Thanksgiving. We had tea and chips and dip (hot cheese & sausage dip and hot spinach & artichoke dip) while we watched Muppet Christmas Carol and Mary and Jordan set up our Christmas tree, in hopes of getting the lights put on it tomorrow. We finished off the evening by watching Pacific Rim, because Flynn and I had agreed to watch it together after we heard it was about giant robots fighting giant aliens. It was exactly what we hoped it would be–a predictable plot with lots of giant robots fighting giant aliens. Sometimes that’s all you want out of a movie. So, great Thanksgiving. Hope you had a great one too! Well, did you really think I’d have time for an entry today? I have done a bunch of shopping and baking and attended a pie social and done battle with onion membranes and gladly welcomed Flynn. I really need sleep now. Today was Tuesday, and you know what that means? That means I have to get up early and drive Spencer to his Bible study. Since I had to be up on that side of town so early anyway, I went ahead and went to Walmart and stocked up on a few more things. Then I picked Spencer up and we came home and by then I needed a little nap because I am still sick. I am so. Tired. Of. Being. Sick. And what’s worse is that now Mary is sick too. Not okay! Sick or not sick, today was the only day that it would work out for me to take Mary to lunch at that tearoom in Shreveport that I like so much. So, we drove over there in pouring rain. Much as I love rain, and much as we need it, after several days of perpetual rain my enthusiasm was wearing thin. We had a lovely salad lunch, during which we looked longingly at the cheese scones on our plates but did not touch them. We brought them home so that gluten-eaters could eat them! We enjoyed browsing the gift shop, but did not see anything that we could not live without and also afford. We drove back through the pouring rain and then I was so eager to lie down again that I forgot that today was the momentous day when we were supposed to pick up the poinsettias we had sold for our 4-H fundraiser. So you can imagine how thrilled I was when I got a phone call saying that a friend from church was going to pick ours up and bring them by our house. I contacted the lady who had purchased them and she was going to be in our neighborhood anyway, so she soon picked them up and that little worry was out of the way. And you know what? Late this afternoon the rain tapered off and we finally had a few minutes of actual sunshine! Oh, how welcome those slanting autumn sunbeams were! Today was the day I had decided to have Mary’s one request for dinner–the chicken enchiladas of worldwide fame. While Mary and I were at lunch, Lucy made some gluten-free flour tortillas so that we would not have to use corn tortillas for us GF people. Thrilled with the success of my homemade gluten-free cream of mushroom soup, I used the recipe as the basis for making homemade gluten-free cream of chicken soup. I was pretty happy with the way it turned out. So, between the three of us, we made a bunch of “regular” enchiladas and some GF enchiladas. When Spencer found out that we were having enchiladas for supper, he invited Kat so that she could taste the heavenly goodness. I was very relieved that she liked them. Jordan was pretty happy too. Actually, I think all of us were pretty happy about the food! We don’t make enchiladas often because they are labor intensive, especially thanks to the gluten issues. After supper we had a skype date with Mercy and it was so good to hear her voice and see her sweet face. We miss her so much and are eagerly looking forward to her return next month. She, however, is enjoying her time in Korea so much that I think she will find it hard to return! I spent the evening making the world’s most sublime cranberry sauce (really; it’s true) and watching one of my favorite Voyager episodes with Lucy and Jordan and Walter. Then I made our sweet potato casserole and got that put away in the fridge. Tomorrow: lots more to do! Yesterday our family was very poorly represented at church. Spencer is still sick, as am I, and Lucy seems to be catching it, so we all stayed home. Mary and Joy slept in and then stayed to spend some time together before Joy had to leave. So it was just Walter, Jordan and Jasper who went to church. I slept for much of the time that they were gone, but eventually I got up and lounged lethargically in my chair–until I got a phone call, that is. My cell phone rang and I answered it. An unfamiliar male voice said, “Is this Linda?” I admitted that it was. He launched into a lengthy description of how he used to come to chai parties. I asked him who he was. He gave me more vague details. Finally, I demanded an actual name, and to my delight it turned out to be a friend whom we hadn’t seen for over 20 years. He and his wife were passing through town and wondered if they could come over for a few minutes. Of course they could! I leaped to my feet and warned the kids that we had company arriving in 10 minutes. There was a brief flurry of activity and then they arrived. It was so nice to see them. I texted Walter to hurry home right after church but that did no good since he didn’t have his cell phone with him! So I sat and visited with our friends and they ended up staying longer than they had intended so that they could at least see Walter when he finally got home after lingering in conversation at church. What a pleasant surprise that was! I always enjoy reconnecting with old friends. After lunch some of the kids went off to Starbucks with Joy and I went grocery shopping so that I could finish making supper. Jonnie came over and we had a great dinner with a gluten-free dessert that Mary made. The weather had turned cold and rainy so it was especially nice to be in our warm house. This morning I slept in a little so that I could make sure Spencer got up in time to go to class and give his presentation. Then I went back to bed for a while because I am still really under the weather. I had to get back up to take Lucy to a lunch with her youth group on the north side of town. I think she had a good time. I slipped out after a while to buy some badly-needed light bulbs at a nearby Lowe’s. Sadly, they did not have the kind of light bulb I wanted the most–the one I need to replace in my desk lamp. I had to order it. When we returned home, it was to find an impatient Spencer who had decided that today was the day for him to get his driver’s license. All I wanted to do was lie down and pass out, but instead I helped find all the documents we needed and we drove 40 minutes to get to a DPS that supposedly is easy to get a test at without waiting. After a fairly lengthy wait in line, Spencer finally got to the front and found out to his dismay that one of the documents he had was not the correct one. He has to mail that document in to some agency and they will then send him the all important purple certificate. Spencer was very polite to the lady but he was pretty grumpy by the time we got back out to Charlene. It was a grouchy ride home! I was thrilled to finally get to lie down. Mary and Jordan had already left for Dallas to go see Flynn. I got up and got ready for my Bible study, only to have no one show up, so it’s been a quiet evening. I really should have done some Thanksgiving stuff, but I didn’t. I still have two more days! Watching Foyle’s War last night. Today was all about waiting for Mary and Jordan to get here. First, though, I had to get through about three hours of hell at Walmart. I thought I was there early enough to avoid the rush–and I probably was, but there were just a whole lot more people than I’m used to because of it being the weekend before Thanksgiving. Many aisles were blocked with pallets of stuff, patient people were trying to burnish the floors, and customers were jostling each other in every aisle. I do not enjoy shopping in these conditions. I enjoy it even less when I am sick, and I am still pretty sick. The checkout line was long, and I came very close to passing out while waiting for our turn to check out, but thank goodness I succeeded in remaining conscious and got Jasper and myself home safely. I alternated between doing housework and lying down because I just could not keep going without rest. Mary and Jordan made very good time, despite unhappy cats in the car with them, and arrived here shortly after 4:00 this afternoon. Then Mary’s friend Joy arrived also and she and Mary went to a concert after supper while Jordan stayed here with us. (Spencer was ushering at the concert.) After another nap, I made it through the evening okay. I would really like to start feeling better! Mary and Jordan’s cats are staying up in Lucy’s room. We thought it would probably be a good idea to keep them separate from our cats. Poor Claudia the mouse is in a house with five cats for the next week! Joy is staying the night but tomorrow she is leaving and so are Mary and Jordan–at least temporarily. The countdown to Thanksgiving has begun! Today dawned rainy and cold. Huzzah! It was hard getting going, because I am still really under the weather, but I had tea and meds and by the time I had to leave to go tutor, I was semi-functional. It was the kind of day when I wish we had a fireplace and that we could all gather round it to do our schoolwork. Instead we were out driving in the cold and rain and mud. The farm was wet and muddy and Lucy and Ilse were less than thrilled with their lab involving peas and DNA. Jasper and his buddies mostly played inside, especially since Jasper sprained his left wrist yesterday and is in quite a bit of pain. Since I have no responsibilities with the Biology class I could stretch out on the couch without guilt since today at least I had an excuse! On the way home I stopped at Target to get more zinc, because it really does seem to be helping. I hear great things about grapeseed oil also, so I may give that a go tomorrow. I really want to be mostly functional by the time Jordan and Mary arrive tomorrow afternoon! A couple of weeks ago I received an email from someone who had seen my book on Amazon and was looking forward to reading it. He was an alumni from Sakeji who had attended just before I did. Then this morning I received another email, from a man with the same last name (presumably a brother). There was no preamble, no introduction. The entire email consisted of a heartbreaking poem about a little boy who felt abandoned by his parents, betrayed and traumatized. The poem is full of pain and anger. It was painful to read. It made me want to go back in time and hug that poor little six-year-old who was hurt and confused. The more time goes by, the more I’ve been forced to face the fact that so many of my schoolmates at Sakeji were miserable there. Almost without exception, anyone who went at the age of 5 or 6 seems to have been extremely unhappy, at least until they reached grade 4 or 5. Maybe they had just learned to suppress their unhappiness better by then. I know that when I was in Form I and II (eighth and ninth grade) I spent many hours at night comforting heartbroken little girls who wanted their mothers. I am ashamed to say that when I was a teenager, and even into my twenties, I scorned those who were miserable at school. I thought they were sissies. In many cases, I was actually treated worse than they were, yet they seemed to be so much unhappier than me. I couldn’t understand why they couldn’t just buck up and get over it. It wasn’t until I reached my thirties that I began to realize that many of these friends of mine were still not “getting over it.” Many of them have carried the hurt and anger through their whole adult lives. They truly felt abandoned by their parents, in some cases. (I never once felt this way. Not even a little.) My heart goes out to them. I wish I could do something to undo what was done and heal their aching hearts. Several people have commented that they found reading my book to be therapeutic. Despite their negative memories and feelings about Sakeji, my book reminded them that there were many happy times there. Those are the times that I choose to focus on, but my heart aches when I hear from someone who is still wounded after 30 or 40 years. Oh, how I want them to have peace. I pray for them. Maybe you could pray for them too. 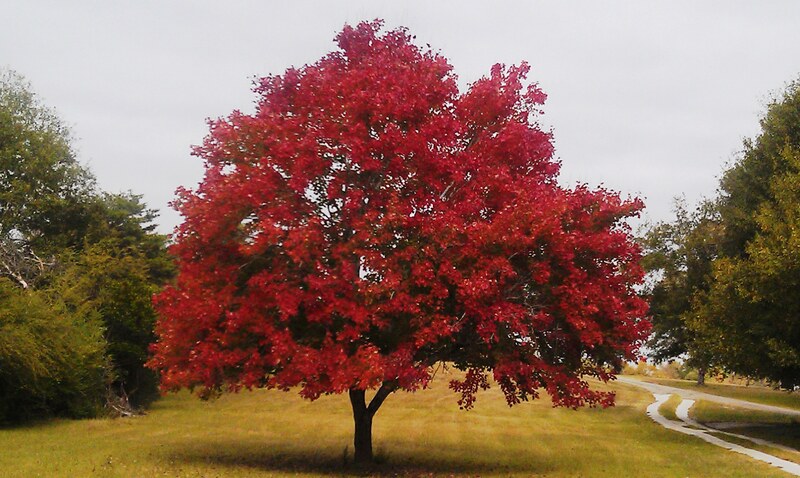 This is my favorite tree on my friend Robin’s family property. This is what it looked like a week ago. Today it was almost bare. Ever have one of those days when even the tiniest task seemed to take a herculean effort? Today was like that for me. I’m pretty sure I’ve got a sinus infection in addition to a cold. This morning I had to get up to make a triple batch of corn pudding to take to a potluck lunch for Lucy’s youth group. I struggled just to shuffle from one side of the kitchen to the other! When I finally had the corn pudding sitting in its water bath in the roaster oven, I staggered back to bed and didn’t get up again until nearly 11:00. I downed some meds and by the time we had to leave for the potluck, I was semi-functional. Although we don’t attend the church where Lucy goes to youth group, two of my good friends do and they were there with their kids (Robin and Kim). I think it’s great that the youth pastor is making this effort to get together with the families of the homeschooled kids. On the way home, with Spencer driving, we stopped by park day (which we haven’t made it to in forever) so that I could drop off a baby gift for a tiny baby who is several weeks old but still not even close to being as big as any of my kids were at birth! Once we got home, it was back to bed for me. I think that I probably could have slept right through till tomorrow morning, but then the pizza would never have got made. Of course, in order to make pizza, I needed to make some new gluten-free flour blend, and I figured I might as well make a double batch because of the holidays coming up. It ended up being a MASSIVE amount of flour but I hope it will last all the way to Christmas. The pizza was pretty good. Despite all indications to the contrary, my head has not exploded yet. Here’s hoping I feel better tomorrow. Today I had two big goals: to get through my class, and to get Lina’s Christmas packages mailed. In order to ensure that I would get through my class, I had to go to Walmart this morning to buy ink, because the printer says the ink is “low,” and that means that any time now it will just refuse to print anything, even if I don’t mind that it prints a little lighter. After that I alternated between doing school with Jasper, preparing the boxes for mailing, and preparing for my class. The class went okay. This is probably the rowdiest class I’ve ever had, but it’s mostly because the kids seem to be enjoying themselves, so I try hard to keep them under control without seeming too dragonish. One of the things we do each class is that I read a few poems from the book that was my favorite book of poems as a kid. I read through those poems so often that they sank into my soul, so naturally I want to share them with my students. Today when I announced that it was time to read poems, the class spontaneously responded by saying “Yay!” Now that was music to my ears! I think the best way to ensure that kids like poetry is just to read them great poems and let the music of the words lure them in. As soon as class was over I needed to get over to the post office to mail the boxes, so I talked Walter into coming with me because it is hard to carry two large boxes and still be able to open doors. I let him carry the boxes and I opened the doors! I am still trying to get used to the staff turnover at the post office. My two favorite clerks have retired and although the new ones are very nice, they don’t know me yet! I was dismayed to find that the cost of sending a flat-rate box overseas has gone up yet again. *sigh* I don’t know if we’ve ever sent Lina a box where the contents were more valuable than the cost of the postage. I actually had a third goal today, and that was to not get sick. By suppertime I was forced to admit that I am failing on that one. Spencer has had a very severe cold/respiratory infection for the last few days, so I kind of knew I was doomed. So far I’ve started my zinc regimen and had a big mug of honey-lemon tea. I haven’t decided whether or not to try slathering the soles of my feet with Vicks Vapo-Rub tonight yet. Thank goodness I don’t have to teach tomorrow!